, an English biographer, was born at Alton, in Hampshire, in 1560 and at eleven, sent to Wykeham’s school near Winchester. 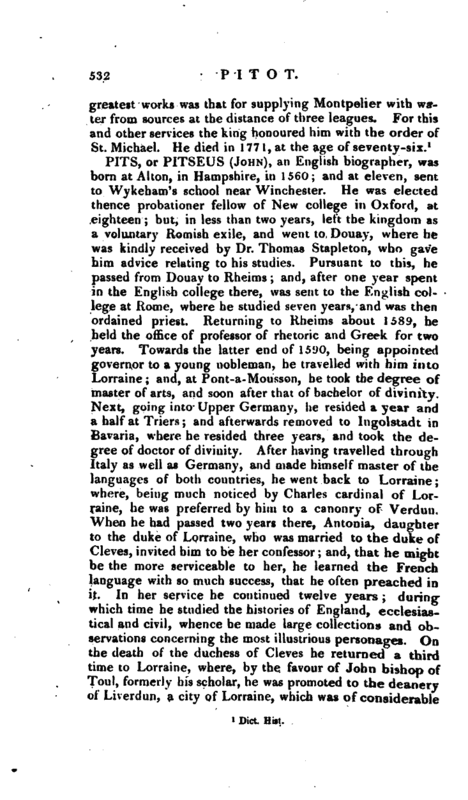 He was elected thence probationer fellow of New college in Oxford, at eighteen; but, in less than two years, left the kingdom as a voluntary Romish exile, and went to Douay, where he was kindly received by Dr. Thomas Stapleton, who gave him advice relating to his studies. Pursuant to this, he passed from Douay to Rheims and, after one year spent in the English college there, was sent to the English college at Rome, where he studied seven years, and was then ordained priest. 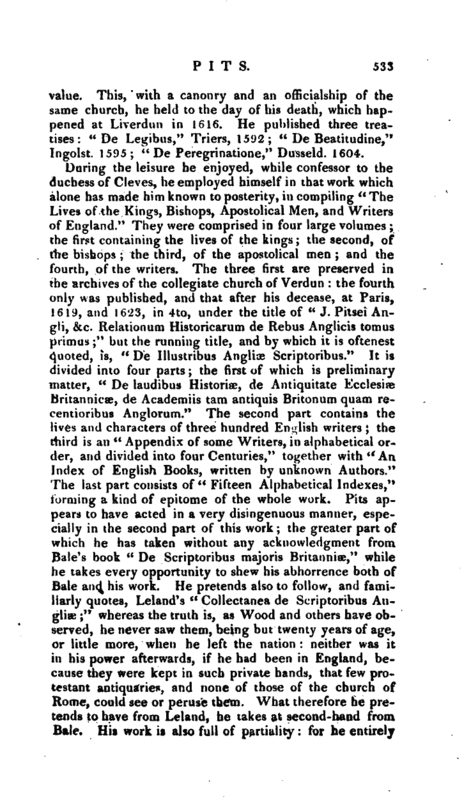 Returning to Rheims about 1589, he held the office of professor of rhetoric and Greek for two years. Towards the latter end of 151*0, being appointed governor to a young nobleman, he travelled with him into Lorraine; and, at Pont-a-Mousson, he took the degree of master of arts, and soon after that of bachelor of divinity. Next, going into Upper Germany, he resided a year and a half at Triers; and afterwards removed to Ingolstadt in Bavaria, where he resided three years, and took the degree of doctor of divinity. After having travelled through Italy as well as Germany, and made himself master of the languages of both countries, he went back to Lorraine; where, being much noticed by Charles cardinal of Lorraine, he was preferred by him to a canonry of Verdun. When he had passed two years there, Antonia, daughter to the duke of Lorraine, who was married to the duke of Cleves, invited him to be her confessor; and, that he might be the more serviceable to her, he learned the French language with so much success, that he often preached in it. 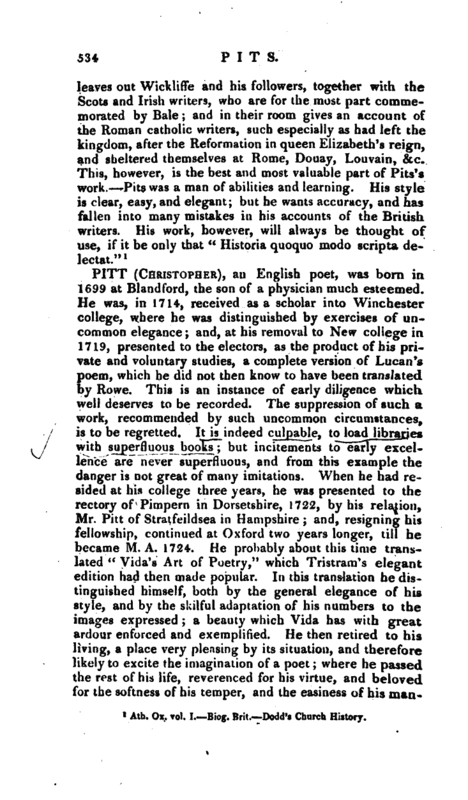 In her service he continued twelve years; during which time he studied the histories of England, ecclesiastical and civil, whence he made large collections and observations concerning the most illustrious personages. On the death of the duchess of Cleves he returned a third time to Lorraine, where, by the favour of John bishop of Toul, formerly his scholar, he was promoted to the deanery of Liverdun, a city of Lorraine, which was of considerable | value. This, with a canonry and an officialship of the same church, he held to the day of his death, which happened at Liverdun in 1616. He published three treatises: “De Legibus,” Triers, 1592; “De Beatitudine,” Ingolst. 1595; “De Peregrinatione,” Dusseld. 1604. Ath. Ox. vol. I. Biog. Brit. Docld’s Church History.